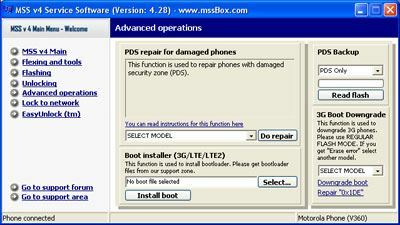 MSS Box II Full with ODM it's revolutionaly tool for all Motorola P2K and C3xx models that can complex service thrm. New version right now support such phones as V620, E550, V550, V551, V3, V980, A1000, E1000, V66, V66 Ivory, V66m, V60, T280, T280i, T280m, V70, V71, V66i, V60i, T720, T720i, T721i, T722i, C330, C331, C332, C333, C336, C359, C350, C550, C450, E380, E390, C370, C350L, C353, C250, V150, V300, V400, V500, V525, V600. 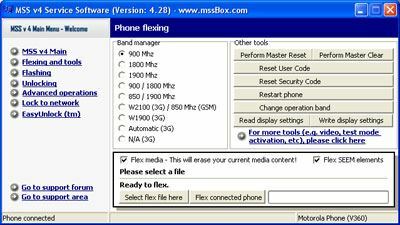 Software can unlock these phones, change language, change firmware, upload FLEX into phone, upload JAVA applications, change IMEI or repair phone after using other softwares and tools. We can guaranty that you will not find any tool even similar to option given in this software so don't miss it. Software sold by our company are 100% original will full future support from VictorGSM, invidual password to proeucer page, access to forum and 12 month of warranty. No more damaged phones, unlock phones simply and easy without testpoint! MSS 4 has new improved PHONE-SAFE unlocking procedures (starting from V66 till new A1000) - which guarantee that you don't risk to kill your phone during the unlocking process! 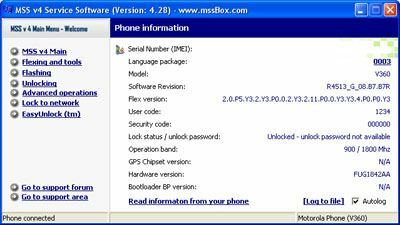 ATTENTION: Software is not using partial flashing for such operation like unlock so workign with MSS for unlocking or IMEI changing will not effect on phone function or language pack. Once phone will be unlocked you can still use original flashes on this phone. 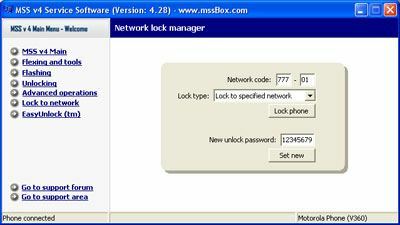 This software will recalcualte code and enter it automatically into phone or give you option to enter it by yourself. File System Management: Take control on pictures, melodies, customization files and much more. Full EEPROM Read / Write. Read / Write battery settings. Read / Write display settings. Read / Write wake-up graphics. Java uploader for Java enabled phones. 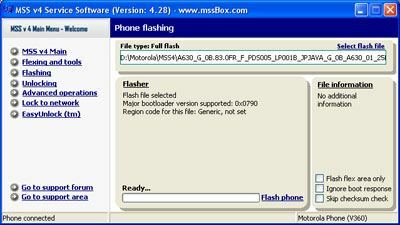 Fast flashing via USB interface. Some web sites offering clones of this device for 1/3 of the real price. Please be informed that you can damage permanently your phone if you using it. These cloned device are without future support. If you don't know this info we strongly suggest to contact with your resseler for money back. Remeber that if you want to have access to Support Area you must first create account and then using your account make order for desired item's - only then you will get access to files that are considered with this product.